I recently met Deborah Ike, who works with church leaders to help them grow their churches and create a life with healthy margins. She is the author of two books, Volunteer Management Toolkit-Church Edition and Protect the Vision: A Practical Guide to Church Risk Management, both available on her website: Velocity Ministry Management. After reading this interview, go check out her site and ministry for church leaders. Michael Mack: I became familiar with and interested in your ministry through a tweet in which you mentioned burnout, which is also a favorite topic of mine. How did you first get interested in that topic? Deborah Ike: I became interested in the issue from my own experience burning out and in talking with others who’ve had similar experiences. It breaks my heart to see people with incredible vision and love for Christ who lose their passion for ministry because they’ve been trying to do too much, too fast. After all, we are still human and have physical limitations. We need rest, sleep, and even play. Our culture focuses on quick results and we can get sucked into that mindset. Instead, we need to focus on staying in ministry for the long haul. That won’t happen if we burn ourselves out. I’ve learned many lessons the hard way and now help church leaders focus on what matters most so they can grow their church and lead a healthy life with more margin. Michael: You write a lot about recruiting volunteers. What three best practices would you provide to small group ministry leaders about finding and asking people to lead a group? Deborah: #1 – Clarify expectations about the role. If you invite someone to lead a small group but only provide vague information about what that role looks like and what you expect a small group leader to do, you’ll have a tough time getting anyone to say yes. 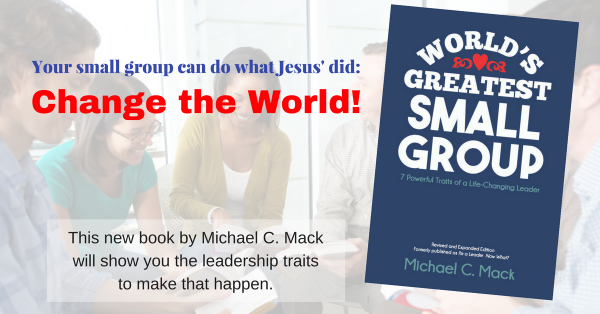 A potential small group leader needs to know what he/she is signing up to do. They’ll want to know things like, How often should we meet? Do you provide a study guide or any outlines for what to discuss at our meetings? How would people join the group? Where do we meet? What resources are available if a member of the group has a question or issue we don’t know how to address? #2 – Look for people already leading. You have leaders in your church—you may need to look a bit more closely. Who holds a leadership role at work? Who has served at various church events and did a great job? Ask around and listen for what names come up most often. Those are the people you should start talking to about leading a group. When you talk with someone about leading a small group, make sure he/she knows you’ll be available to answer questions and/or provide direction as needed. Michael: A healthy small group is a team that works together to carry out the mission God gave them. You write and speak on the topic of teamwork. What are a couple teamwork principles that small groups could use to grow in this area? Deborah: Communication is key in any group setting. This includes learning the personalities and communication preferences of each team member. When we focus on communicating with each individual in a way he/she is best able to receive, we avoid potential conflict from misunderstandings and have more productive conversations overall. Also, don’t be serious all the time. Yes, it’s great to have deep discussions about faith. However, it’s also really helpful to just have fun together, too. Make ice cream sundaes, go bowling, play a board game, etc. Those moments break the ice, help you see another aspect of each other’s personality, and will help your group grow closer together. People are more willing to engage in challenging topics when they trust and know the rest of the group. Having fun together is a great way to start building that trust. Michael: What’s your favorite thing to do to unwind (and avoid burnout)? Deborah: I’ve found exercise to be a great way to reduce stress. In fact, I have my best workouts after a challenging day! A tough workout releases endorphins, loosens up tense muscles, and makes me feel better overall. Michael: Thanks, Deborah, for your great insights from a fresh perspective on leading healthy, growing small groups. And thanks for using your passion for God’s church! QUESTION: What is the biggest takeaway for you as a leader from Deborah Ike’s interview? Please click the Comments box, below, to join the conversation! I really liked this interview with Deborah Ike and especially the discussion on burnout. I also fell prey to burnout several years ago when I was involved in more responsibilities and activities than I should have been. You said “A healthy small group is a team that works together to carry out the mission God gave them.” This is a great statement. One thing that did not come out explicitly in the interview is that the small group leader needs to empower members in roles that support carrying out the mission God gave them. The leader can’t do it all. If the small group leader does attempt to do everything, the group will not be effective and burnout is likely in the leader’s future. Thanks for sharing your discussion with Deborah Ike.